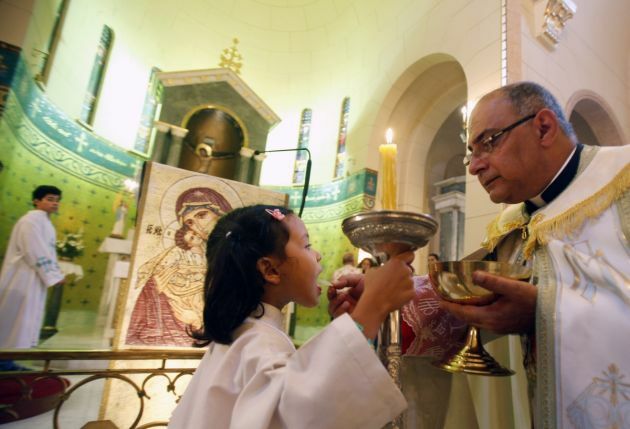 (Photo: REUTERS / Amr Abdallah Dalsh)An altar girl receives communion from Priest Philip Najim during Sunday service in Saint Fatima Church in Cairo August 18, 2013. Egypt's Coptic Christians, who make up 10 percent of its 85 million people, have coexisted with the majority Sunni Muslims for centuries. Violence erupted periodically, especially in the impoverished south, but the attacks on churches and Christian properties in the last week are the worst in years. A Coptic Catholic Church in Egypt has been bombed by suspected armed men, injuring two police officers standing guard at the building, a church official said. The Coptic Catholic Church of Kafr el-Dawar, which is overseen by the Franciscan order, was attacked March 9 by an undetermined number of men, said Bishop Adel Zaki, apostolic vicar of Alexandria for the Catholics of the Latin rite. The suspects were believed to have hurled an explosive onto the church, damaging the structure and injuring the police officers providing security there, the bishop told the Catholic news agency Fides in an interview. "According to preliminary reports, the armed assault was carried out at three in the morning. The injured policemen were taken to the city hospital," he said. Zaki suspected that the attack could have been carried out to foster an impression of instability in the country. He added that the perpetrators appeared to be intent on disrupting an international gathering in Egypt this week. "The episode is to be linked to other attacks carried out against different objectives, which in my opinion are designed to give the impression that Egypt is an insecure and destabilized country," he explained. "Maybe one wants to send signals of this type in view of the International Conference of aid to Egypt, to be held in Sharm el Sheikh next March 13," he continued. The church, dedicated to the Virgin Mary, is located in the town of Kafr el-Dawar in Lower Egypt, about 20 kilometers (12 miles) from Alexandria, in the Nile Delta. Investigators are still working on leads to establish the identities of the perpetrators. Authorities have yet to link the attack on the upcoming conference. About 10 per cent of Egypt's 86 million people are Christians with some 90 percent Muslim.